It’s 1914 and Liam Mannion is forced into exile for a crime he didn’t commit. He flees Balbriggan, the only home he has ever known and travels to England, where he enlists and endures the torment of trench warfare in France. Five years later he’s back in England, a changed man, living in the shadow of his battlefield memories. Liam finds work in a Manchester cotton mill but prejudice and illness soon see him destitute. Starving and desperate, he enlists in a new military force heading to Ireland – the Black and Tans – and is posted to the very town he fled as a youth. While he has been away Liam’s childhood friends have joined the republican cause, while his brother has allied himself to the Crown forces. Liam must wrestle with his own conflicted feelings about duty to the ruthless Tans and loyalty to his friends. The potent combination of ambition, patriotism and betrayal collide, forcing him to act as he comes face to face with the man who spread lies about him all those years before. I’ve just finished reading David Lawlor’s TAN and frankly I’m all done in! On page one I was transported to Balbriggan, Ireland in 1914 and thence to the Continent for the first World War and back again to Ireland for a horrifying story based on factual events. Lawlor is a masterful storyteller and I was scarcely able to put his book down for meals or sleeping. Each character in this tale became real for me. I endured their fears and felt the bile of anger and frustration rising in the back of my throat. I smelled the cordite hanging in the air after a pitched battle, and fell exhausted back into my chair. The awful history of the Tans meting out their twisted sense of “justice” in British occupied Ireland is a story well known to all. In TAN, David Lawlor has made it personal and real. It isn’t without its moments of levity though; there were smiles and laughter enough. I did need to look up, and clarify a few Irish slang terms early on but it didn’t detract from the story at all. I’m not even certain looking them up was necessary for the enjoyment of the story. That’s just my way. The pace of the tale is tight and well written with little “cliff hangers” tossed in here and there that made me more and more anxious as the story progressed. The immensely satisfying ending left me with an enormous smile on my face despite the fact that I am sorry to be saying farewell to a group of characters I quickly came to love. This book is a definite 5 star read that I wholeheartedly recommend to anyone who enjoys history, action, and mystery/suspense. Get it. Read it. You’ll love it! 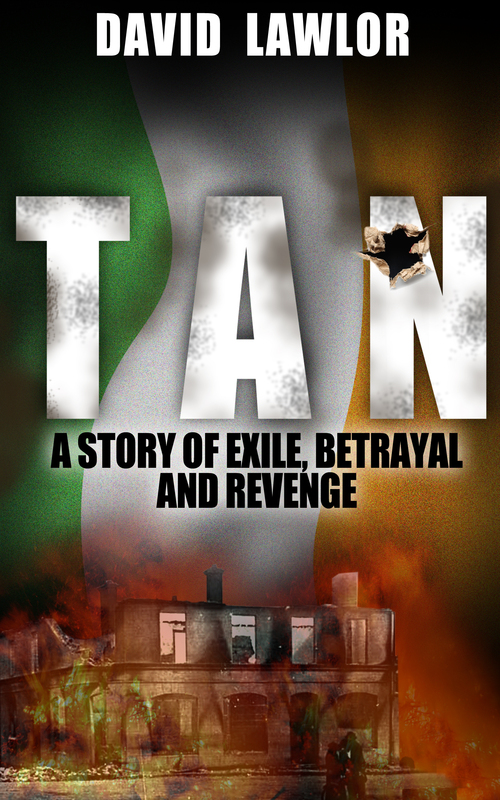 Tan is available at Amazon.com, Amazon UK, and Smashwords . Ol' Big Jim, has been a storekeeper, an embalmer, a hospital orderly, a medical biller, and through it all, a teller of tall tales. Many of his stories, like his first book, New Yesterdays, are set in his hometown of Piedmont, Alabama. Since 2009 he has lived in the oldest continuously inhabited city in the world, Amman, Jordan where he spends his time trying to visit each one of the thousands of Ammani coffee shops and scribbling in his ever-present notebook. This entry was posted in Books and tagged author, Black and Tans, book, Ireland, reviews, writing. Bookmark the permalink. You’re most welcome David. Every word was true; I enjoyed Tans very, very much! Thanks for telling us about this book. It sounds like an interesting story. Really, it was a good book. I had great difficulty putting it down and very highly recommend it to you. Thanks so much for stopping by and leaving your comments. It’s going on my reading list now! Thank you for this recommendation. You’re so gonna love it! Thanks for coming by, Ash!